Blank space: Great when it’s a Taylor Swift song (or a nifty 20’s-style cover of same), not awesome when it’s on your editorial calendar. You want to publish with a steady cadence to keep your audience satisfied. But you know that filler won’t do—it’s got to be quality and quantity. Great content is no accident. It requires careful planning to provide the value and variety your audience craves. At TopRank Marketing, we create content for dozens of clients. That’s a lot of blank space to fill. But when it’s over, we know the high was worth the pain (sorry, now I have Taylor Swift stuck in my head for the rest of the day. Hopefully you do, too). 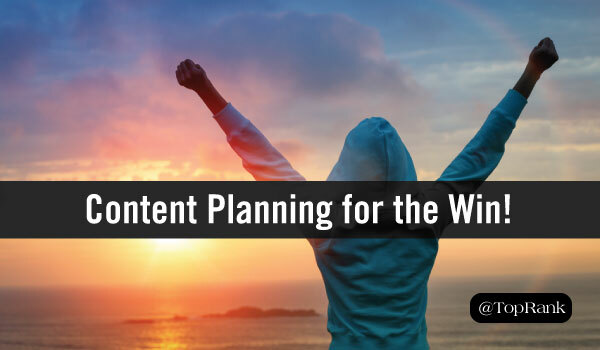 Here’s how to create a content plan that’s designed to excel. 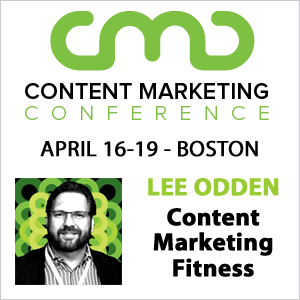 The goal of content marketing is to compel your audience to take action. Without the action, you’re missing the “marketing” half of the equation. So don’t start with what you want your audience to know. Start with what you want them to do. The desired action could be signing up for your blog, downloading a gated asset, attending a webinar, scheduling a demo, or just sharing your content on social media. Whatever you decide, make sure each piece of content is connected to a measurable result. At TopRank Marketing we have a name for the type of content that gets results: Best Answer Content. The word key word is “answer,” as in “a response to a question.” You’re not starting a conversation about your brand, you’re continuing a conversation about what concerns your audience. Listen to the questions your audience is asking through search engine queries, emails to your sales department, forums like Quora, and tools like BuzzSumo and Bloomberry. Lower-funnel content is designed to lead directly to revenue. So it’s the type of content upper management likes—meaning it’s the type that helps justify your budget. It makes sense that marketers tend to focus on the lower funnel and go light on the upper stages. The problem with that approach is that most of your traffic and interest is in earlier stages. If you don’t fill the top of the funnel you won’t have anyone left to read your awesome lower-funnel content. It’s important to find a content balance, with a variety of content across all stages of the funnel. The quantity of content in each stage should look like a funnel, too. Think lots of content in the upper stages, less (but more in-depth) content at the bottom. I don’t envy the folks at Buzzfeed. They came up with a winning content formula and now they’re stuck with it. Pity the writer who has to come up with yet another “28 Hilarious Things Dogs Did This Passover (You Won’t Believe #24)!” As the world has moved on from clickbait-y listicles, the site has struggled to reinvent itself. Keep your content fresh, and fill holes in your editorial calendar, by changing up the content type. Save room for those easy-to-write, sharable listicles, sure. But balance them with thought leadership pieces that firmly establish your brand’s point of view. Add how-to articles that are 100% utility. You can even round up useful content from other sources and curate for your audience. At LinkedIn Marketing Solutions*, they have a lovely mixed metaphor to describe their content strategy. It starts with a “Big Rock,” a hefty piece of gated content that includes visuals, influencer interviews, and in-depth discussion on a single topic (like their Sophisticated Marketer’s series). They use the Big Rock to create “turkey slices,” blog posts that repurpose a small part of the content. Turkey slices help fill in your editorial calendar, and each one can serve to promote the Big Rock. A big enough Big Rock can keep your blog supplied with turkey slices for six months or more. Just don’t ask why the rocks are made of turkey. When you have plenty of thought leadership and useful, practical content, it’s okay to let loose every once in a while. Generally, people like to be entertained and like to laugh. Even decision makers at Fortune 500 companies have been known to appreciate the occasional chuckle. So there’s no excuse for not experimenting with a little comedy, as long as you stay consistent with your brand voice. Ease into the idea of humorous content with an April Fool’s Day post—it’s the one day even the most staid of institutions can crack wise. If you get a good response, try a funny, light post once a month or so. Still not convinced humor would work for your industry? Look, if financial services marketers can enjoy a silly post, your audience likely will, too. I’m starting to get really excited at the potential of interactive content. It takes less than an hour to make a quiz that looks professionally designed, can be embedded on your blog, and provides detailed analytics on the back end. You can create a poll or a survey even more quickly. Your chief competitor for your audience’s attention is not other content—it’s everything else in the world. We’re asking people to stop whatever else they were doing, ignore every other source of distraction, and engage. Interactive content makes it far easier to earn that level of attention. “Authenticity” and “transparency” are marketing buzzwords that have almost, but not quite, lost their meaning through repetition. But there’s a reason we keep talking about these two concepts: Consumers want to hear the authentic voices of the people behind your brand. They know the purest expression of your brand’s values comes from your brand’s employees. Cultivate these voices by asking internal experts across the organization to contribute to your content. As with external influencers (more about them in a moment), start with a small request. For example, if you’re writing a how-to guide, ask someone in a relevant department to contribute a quote or two. Next time, ask for a full interview. Before you know it, you’ll have a team of regular contributors, filling your calendar with diverse voices across your organization. At TopRank Marketing, we have our own unique take on influencer marketing. It’s not about paying Snapchat stars thousands of dollars to pose with a product. Rather, it’s about building relationships with people who are genuinely influential to a relevant audience, and aligned with your brand’s goals and values. You can start building relationships without even making contact with an influencer. For example, you can create a post that includes already-published quotes from influencers. Like, say, this post. Let your influencers know that you featured their expertise. Then nurture the relationship by helping to promote their content. Eventually, you can start co-creating content with the influencer, building in their contributions from the ground up. As with internal experts, start with an interview and go from there. Still stuck with a few blank spaces in your calendar? Let your audience fill them in for you. User-generated content helps foster community, builds enthusiasm for your offering, lets customers see real-world examples of what your company can do, and a host of other benefits. The best way to encourage user-generated content is, simply, to ask for it. Ask for reviews, product photos, customer stories. Run a contest and recognize the best submissions. Even better, ask your most valued clients if you can feature them—they will very likely jump at the chance. You get a compelling testimonial, they get extra visibility. A blank content calendar can be daunting. But don’t fill it in with random acts of content. Start with your goals in mind, then match them with the topics your audience most wants to hear about. Plan for a good variety of content types and formats to keep things fresh, and make sure to fill the top of your funnel as well as engage the lower part. And if you need help creating great content that inspires action, don’t hesitate to contact us. We’ve got a long list of satisfied customers. But we’ve got a blank space…and we’ll write your name. I read your articles all day. Learned a lot, thank you.